NOTE: WORKS FOR DPS BUILDS NOW TOO. -Mean Mitigation helps with how to reduce incoming damage, making the decision of what stats/skills use easier. -Threat helps you increase the damage/threat you do, also letting you choose the better spec or stats. And sorry for all the typos and broken grammar, English is not my first language. a) Is recommended to work on a copy of the spreadsheet, the main sheet could be been modified every minute if I'm working on it. You'll need to create Google account tought for that. You can also download the spreadsheet as excel or open office archives, but the DPS/Threat relative stat values script won't work. You can do it manually increasing the stats by 1 and writing down the DPS. Pale blue are titles and info. Pale green are data that can be modified by the user (stats, encounter or rotation configuration, etc). Pale red are important results after all the calculations. Never modify this unless you know what you are doing. Grey/white cells are internal calculations. Never modify unless you know what you are doing. c) Sometimes Google Docs introduces a number as a date or plain text even if the cell has a number format, giving VALUE# errors on some cells. The workaround is to write '=' first. So instead of writing 1.5/1,5 just write =1.5. d) The spreadsheet has 3 different sheets right now, as you can see on the bottom of the screen: Mitigation, Threat and Calculations. You never need to look at the Calculations sheet, is all internal stuff like tables, or extra calculations. The Mitigation and Threat sheets are the important ones, each one helps with a facet of our tanking role. Note: is recommended to start configuring this sheet, even if you are only interested in threat. Some stuff like % shielded attacks or some aspect of the build are taken directly from this sheet. Introduce your character level. Mitigation sheet works for every level (at least 20+, I need to take a look again at lower levels). Threat sheet currently don't, as is level 50 only. Choose your Advanced Class so everything has the correct names/titles. Fill the skill section with the build your character has, or the build you wanna test. Only skills that increase Mitigation are listed here. If you have any of the bonus sets listed here, put Yes, otherwise put No on the cell. Only one is included right now, as is the only that changes Mean Mitigation. The other increases the duration of defensive cooldowns. When you finish entering the data, you can take a look at the last column, where you can see how much Mitigation gives each skill point (remember that it only works for skills that you have on your build), and can help you choosing what skill to drop if you wanna play around with your build. Is per point so you can compare easily even if one skill has 2 point max and other has 5. This is just the same calculations the game does on the character tab. The Totals must be the same as the ones you see on your character info. Also you can see in the last column the modified total if you increase the pertinent stat by 1. You don't need to touch anything here, are there isn't much interesting info either. When a boss tries to hit you, there is a first roll against your defense chance %, if you win the roll, the boss fails to hit you, and you recieve 0 damage from that attack. You can see your chance on "% of attacks avoided" section. If you lose the roll, there is a second roll against your shield chance %. If you win that roll, the boss hits you, but his damage is reduced by your shield absorption %, and then by your Damage Reduction. 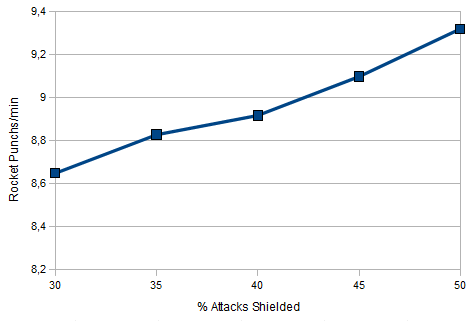 You can see your shield chance on Diminished Defensive Stats, the shielded attacks over the total (less than your Shield Chance %, as you can't shield a totally avoided attack), here in "% of shielded attacks". Also you can see how much damage you take from shielded attacks on "Damage Taken % from Shielded attacks". If you lose the second roll, the boss hits you for full damage, and you only reduce the hit by your Damage Reduction from armor. You can see how much this happens in "% of full hit attacks", and how much damage you take from these kind of hits on "Damage Taken % from Full hits". For every 100 attacks on average you get hit 15.49 for 0 damage, 37.05 times for 39.12% damage and 47.46 times for 47.49% damage. So doing maths: 15.49 x 0 + 37.05 x 29.12 + 47.46 x 47.49 = 3332.77% of a boss hit. You divide by 100 hits, and you get 33.32%, that's the average damage you take from a boss hit. Mean Mitigation is just how much damage you reduce the hits, so is 100 - 33.32% = 66.68% for this scenario. This is the number you want to get higher as possible as a tank. For example, if you are taking 33.32% damage on average, you are reducing a 1000 hit to 332. If you increase your MM by 1%, you are now taking 32.32%, or 323 damage. 323 damage is 2.71% less damage than 332 [100x(1-323/332)]. This is exponential, but also getting an extra 1% MM is harder as you get more and more, thanks to Dimishing Returns. The exist for this reason, or we'll be unkillable with enough gear. This section helps you comparing the different stats and their contribution to your Mean Mitigation. Is pretty simple, just calculates your MM for different scenarios, increasing your stats by 1, and tells you how much MM increases, when you get 1 extra Armor, Shield Chance, Shield Absorption or Defense. These values change with your gear, so are never a rule set in stone. If you change your gear around, the Relative Stat Values will change, and maybe change enough to make another stat the most valuable. Taking in account these values, you can compare gear piece by piece and see which one is better. Let's say you wanna compare 2 items. The Item A has +23 Armor, +22 Defense, -25 Absorb compared to Item B, and you have the these relative values for the stats: armor 0.35, defense 1.05 and absorb 1.47. Just multiply and sum, you gain 8.05 RSV from Armor, 23.1 RSV from Defense, and lose 36.75 RVS from Absorb. Item B is better, 36.75 > 23.1 + 8.05. That doesn't take in account threat stats, but the balance of threat/mitigation stats is out of reach of this spreadsheet, and depends on the content you are facing mainly. Also Endurance is another ignored stat, is good to have but doesn't help with Mitigation, but gives your healers more margin to heal you. This section is pretty straightforward. You can configure the values of the relics you have, and tells you how much you reduce on average the incoming damage while the use lasts. This section is on constant WIP. 31/8/2 seems to be the way to go. Has the better mitigation of every possible skill build. Also that build has the better sustained dps, take a look at these link for a detailed comparison using the spreadsheet. 1 point on Hot Iron can go to Prototype Cylinders or Advanced Tools, so feel free to put the point wherever you want. Absorb Rating > Defense > Shield Rating > Armor. You don't need to change your build, that's the first thing you need to know. -Elemental damage is usually the best, as bosses seems to have little to none damage reduction to this kind of damage. -Kinetic damage is reduced by armor, so the skill will always do less damage than the tooltip indicates. -Weapon Damage based skills can miss with more frecuency, as we don't have usually the Ranged Accuracy capped (these skills needs 10% extra accuracy). So even if you see an high damage on the tooltip remember that probably around 10% of the attacks will fail to hit. 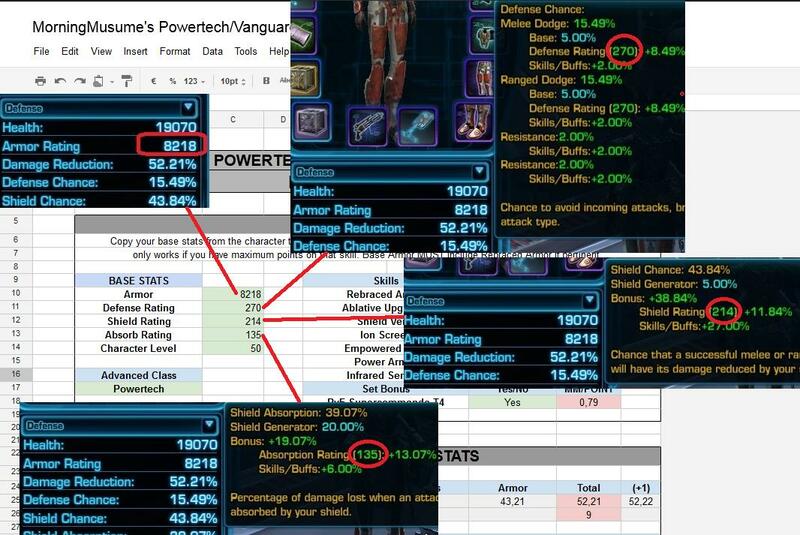 Weapon Damage skills for Powertech are Unload, Rapid Shots and Rail Shot. -The tooltip shows all the skills that increase the damage of that skill, but we can't see other important stuff like extra crit (fire skills and Rocket Punch), or extra surge (Rocket Punch) or chances to proc extra damage (Unload, Rapid Shots, Rail Shot and again, Rocket Punch). Note: the chance of IGC proc is included as a 15% of the damage for Weapon Damage skills, and 100% of the damage for Rocket Punch. The damage is divided by cast time, and is based on my character stats. Never ever get your heat over 40, unless you need burst damage, and not sustained damage. I need a few calculations more before having a 100% precise rotation, but this is a first draft. Always use TSO with Flame Thrower or Death from Above (if you have less than 20 heat, never use TSO, wait for a another cast). Always use Explosive Fuel when you have Rocket Punch without CD, and Flame Thrower will be up in the next 15 seconds. But Shield Rating also helps with procs (extra Rocket Punch, Vent Heat), why we don't stack it? Shield Rating has diminishing return, you can't shield a defense'd attack, and is only a 50% chance with internal cooldown. Increasing SR give us little extra chance to proc those skills. For example with 45% Shield Rating, you get a Vent Heat proc every ~13.83 seconds on average (considering a boss hit every 1.5 seconds). With 50% Shield Rating you get a proc every 13.07 seconds, or about 1 extra heat every 30 seconds. And you need 110 Shield Rating for that. With the extra Rocket Punch is worst, as RP has a normal CD of 9 seconds so you don't get that many extra RP per fight. Again with 45% Shield Rating you get around 9 RP per minute (2.5 extra). With 50% Shield Rating you get around ~9.2 RP per minute, so 1 RP extra every 5 minutes on average. -I ignored Critical Chance from bosses on the Mean Mitigation tab, because there isn't conclusive info on that matter, and unless there is a third roll for crits, there is no way to reduce the critical chance from bosses with the DR on defense/shield rating. -All the calculations consider that bosses have around 30% armor reduction (after -20% armor debuff), no elemental/internal damage reduction, 5% defense (the consensus at least) and attack every 1.5 seconds. You can change that data in the spreadsheet. -I completely ignored Alacrity as does almost nothing for us (a tiny bit faster cast on Unload and Flame Thrower). I'll probably add it in a later version for the sake of completion. Thanks to Gankstah for the formulas here. -Fixed a few bugs with Sweet Spot. Now will give you impossible results less often (like negative Shield Rating), but still have work to do. -Added a Threat Tab with many info regarding how much damage does your skill, etc. Still needs work too. -Added support for Supercommando 4 pieces bonus. -Added a new section showing the Mean Mitigation increase with cooldowns or use relics. -Fixed some typos and made the base Spreadsheet easier to upload to Google Docs with less visual bugs. Less work with each update, yay! -Added support for any character level. -Added support for Nightvision Scope / Infrared Sensor skills. -Now calculates the Mean Mitigation gained per skill point. Only works if you have maximum points on that skill. -Now calculates the best combination of Defense/Shield/Absorb near your defensive stats values with the same sum of stats, the Sweet Spot, with exact values and Mean Mitigation gain. The calculation algorithm is pretty rough, but is hard to do keeping the compatibily with Google Docs. Thats some nice work, you should add Infrared Sensors, 2 points with 1% melee and ranged defense per point. Very, very nice! Thanks for the good work. Took me a few minutes to actually grasp the purpose of that spreadsheet, but now I recognize the value. Relative stat values are especially crucial to keep track of. New version uploaded adding some suggestions. Sorry I didn't added the option to modify base armor value with the Rebraced Armor skill, but I hope isn't needed with the new MM/point feature. You always need to put your character tab stats and your skills. If you wanna change them be careful they don't change your character tab stats. A new version has been uploaded. See the first post for the links. Probably will be the last version for a while. All the powertech seems to be focusing on PvP or DPS, so I don't see the reason to add more features, as I don't need anything else included. I'll probably work on a threat spreadsheet next. A few words about Mean Mitigation and Increases. MM is exponential, so an increase of 1 MM when you have 60 MM is better than when you have 40 MM. Take that in account when looking at increases of MM via skill points, stats, cooldowns, etc. That's why getting an extra 1% is harder as you get higher on MM, that's why Dimishing Returns exist in the first place, and that's why undiminished defensive stats (via skills, bonus, etc) are so good. Ok... for those of us who are tech/math not-so-enclined, what do the results say we should DO, assuming we want to maximize the defensive attributes that work, (and skip the ones now found to be lacking) and have some DPS as well? You don't stop playing games when you get old... you get old when you stop playing games! I recommend a typical 31/8/2, with the defensive gear oriented to Absorb > Defense > Shield where you can. More armor is always good. Keeping tech accuracy to 105% and doing a good rotation will help with threat management. Surge is a great threat stat but is hard to get in tank gear. A new version with a DPS/Threat tab is now available. Still have much work to do, but is pretty functional at least for a typical 31/8/2. I updated the OP with new info. Read if you are interested. I'll keep adding stuff in the next hour or so. I'm working on polishing it right now, I uploaded a more recent snapshot to Google Docs. -Added a -% Damage Taken to Cooldown/Relic use, give us a better idea. -Rail Shot was being reduce twice by armor. -Heat Blast doesn't count as fire damage, so doesn't benefit from fire dmg/crit skills. -Better estimation of extra Rocket Punch via shield procs (did a few hours simulation). Works pretty well for 1.5 seconds between attacks from the boss. -Changed dmg/heat from skills to balance heat instead of initial heat cost. -Retractable Blade and Incendiary Missile rotations work pretty well now. RB is a bit lower dps (5%), and IM is a little better dps (2% or so), but loses mitigation. -Rapid Shots has a 15% chance per hit to proc IGC, so around 40-45% chance to trigger it, depends on your hit%. -Unload has a 15% chance per hit to proc IGC, also can proc TWICE in one cast (IGC has a 1.5 secs CD, and Unload lasts 3 seconds). Has around 50% chance to trigger 1 IGC, and 30-35% chance to trigger 2. The formula isn't exact and is a bit on the higher side. -Explosive Fuel extra damage is now better approximated for all 3 rotations.